Detail from a daguerreotype believed to have been made by N. H. Shepard in Springfield, Illinois. 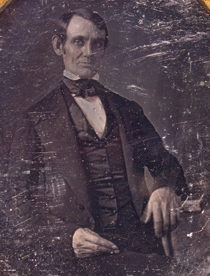 It is the first known portrait of Lincoln, taken when he was elected to the U.S. House of Representatives in 1846. Courtesy of the Library of Congress. Abraham Lincoln was born on February 12, 1809, in an isolated one-room log cabin near Hodgenville, Kentucky. His early life on the frontier included close family ties, hardships, losses, and few opportunities for formal education. Lincoln’s drive to escape this life and leave his mark on history led him out of the frontier and onto the national stage of American politics. "It is great folly to attempt to make anything out of my early life. It can all be condensed to a single sentence, and that sentence you will find in Gray’s Elegy: 'The short and simple annals of the poor.'"